We model the electricity market to demonstrate that changes in the price of natural gas can cause the market and non-market impacts of bulk electricity storage to move in opposite directions. We provide evidence consistent with the model using a series of reduced form tests on data from 2005-2010. We then simulate installing bulk electricity storage on the US electric grid. We find that lower natural gas prices generally reduce the market gains and non-market costs of storage. However, direct non-market costs are still positive which means that there is no argument for subsidizing storage to mitigate pollution given the current mix of generating technologies; arguments in favor of bulk storage R&D subsidies ride on public good aspects of technology and dynamic investment incentives for intermittent renewables. 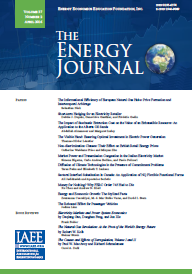 Proceedings - India’s Energy Policy: Is the unthinkable possible? EEEP - How Should Different Countries Tax Fuels to Correct Environmental Externalities?